Bringing the pop legends of the late 90’s into the 2019 music scene! Nsync, do they still have it? Clearly they do! Ariana Grande AND Nsync performed at Coachella on Sunday. Ariana filled Justin’s part of Nsync’s song “It Makes Me Ill.” They also performed the classic ” Tearnin’ up my heart”. 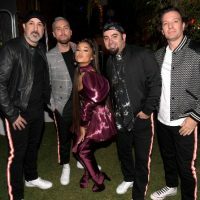 We think it’s safe to say that she was over the moon with the opportunity to perform with Nsync as she noted of the collab: ” I can die now”. The legendary boy band has commented that performing with Ariana Grande has been a dream of theirs. Was bringing pop icons from the late 90’s/early 2000’s and Ariana Grande together a brilliant decision or what?! Watch thier performance below.